Don't you think this Aussie Helpline is unfair? Basically what the pic says is if you're a lady in a domestic violence situation, call & we'll help you. 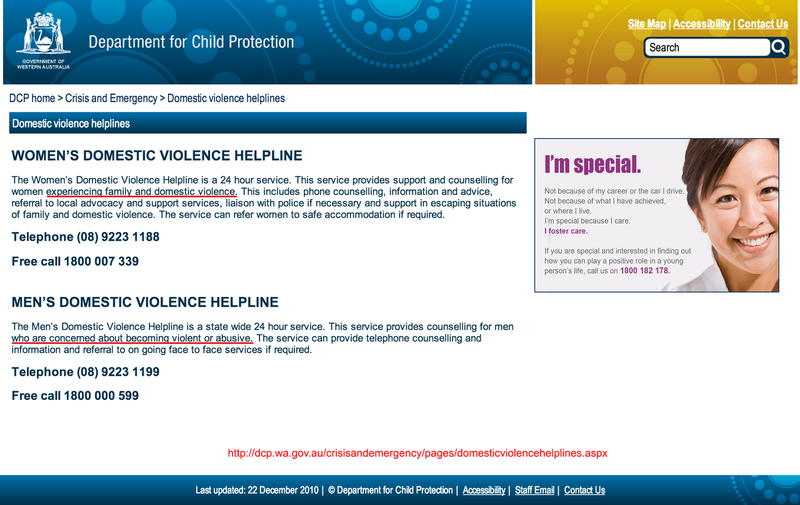 Renata wrote: Don't you think this Aussie Helpline is unfair? Yes I think it is quite unfair, as is with the typical "women and children protection" thingy, but I can't imagine "men protection" from abusive wives who beat the crap out of them (yes, it happens eg. in the Philippines). Maybe it's just that women are perceived as weaker species (as even leveled with children). I therefore conclude that there's no such thing as gender equality.